Spoiler Review is a new series where I will review movies that require many spoilers in order to review them properly. This is my review of “Gravity.” This goes without saying: SPOILER ALERT. Every time a movie comes out that uses 3D really well, like really really well, I never hesitate to call it the second coming of cinema. “Avatar.” “Hugo.” “Life of Pi.” Yes, I do strongly regret giving “Avatar” that much credit. I don’t want to say “Gravity” has changed the game. It’s just responded to the tools of our time so well and it has done what many others only wished they could accomplish. More importantly, if you ever doubted that the wonder of the movies has been stolen by TV, then look at “Gravity,” and you’ll understand that it never went anywhere. This spoiler review needed to exist. It is impossible to fully expound on “Gravity” without revealing many important twists and turns. Also, it is the kind of film enhanced by going in completely surprised. Once things start to explode, the story seems very straightforward. Yet, it also has such an uneasy and unpredictable edge to it. Maybe that’s because Cuaron decided to kill off one of Hollywood’s biggest stars halfway through and then let one person run the rest of the show. Cuaron pulled a similar move in “Children of Men.” I like when movies do this. Wait, that sounded bad. I’m not sadistic, but taking an event that would normally end a film and putting it so early on is always daring. Not only that, but it will always carry the film into another direction. Clooney’s death also leads to one of the greatest fake outs in recent memory. Kowalski’s return elicited groans from the entire audience. However, it just didn’t sit well with me from the beginning. For one thing, he kicks out a window in outer space while she sits there with no helmet on. She covers her mouth and somehow is fine. This isn’t the season of “24″ with the nerve gas where everyone just covers their faces with a tissue and is somehow fine. “Gravity” can’t get every scientific detail right, but this one was too obvious. After Kowalski dies, Stone is left to fend for herself. And oh what a beautiful performance Bullock gives. She takes what could have been a repetitive 91 minutes of screaming and floating and turns it into a one woman show. It’s a lot like James Franco’s performance in “127 Hours” as she displays so many altering personalities in such a short amount of time. The most beautiful moment in the entire film is not a shot of space, but rather the scene where Stone communicates with an unknown Chinese man. She hears his dogs bark and asks them to keep barking. Then she barks along with them. These two have so little common and don’t even speak the same language. She’s trying literally anything to keep herself motivated to survive. Eventually, there is going to be a “Gravity” backlash, because that’s what happens with any movie this big. In fact, its already begun. People are going to compare it to other movies and identify a lack of originality. However, what I hope everyone will remember is that this is the anti-space space movie. “Gravity” is not against space, but rather it challenges our notions of what lies above. At the beginning, Kowalski plays an old western tune as he floats around. Space has always been labeled the final frontier, but what is rarely acknowledged is that it is so hard to conquer a frontier that we know so little about. Unlike many of its contemporaries, “Gravity” acknowledges the many dangers of space. Its opening title card makes note of how much the temperature fluctuates. A little bit later, Kessler Syndrome causes a chain of destruction that I am still trying to wrap my head around. And then there is Bullock, who is constantly fighting the voices in her own head as she doesn’t have anyone else to talk to for a majority of the film. She constantly has to fight between holding on to any object that will keep her alive, and letting go of all of her earthly problems, which are inconsequential when the remains of a Russian satellite are hurtling right towards you. 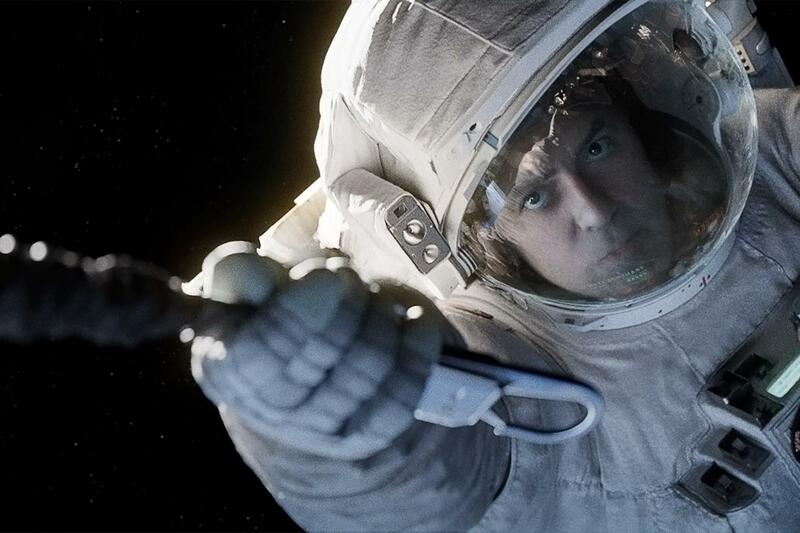 “Gravity” shows so much, but leaves much more to the imagination. The image of her driving through Illinois with the radio playing and no direction at all is a sad yet lovely one, enhanced by the fact that we never actually get to see it. With this, the film also plays against the idea of sci-fi films in which one tries to escape their earth forms in search of a better self. Ryan Stone was hired for the job because she’s a damn good technician, but I’m sure she also really needed an escape from her lonely life. Yet, orbiting above earth, all she finds is chaos. Cuaron has proved himself a master of visual metaphors. That’s why I’ll let it slide every time Clooney says “I have a bad feeling about this,” because that is the worst foreshadowing possible. Instead, just marvel at the moment Ryan boards the ship and sheds her suit, her body curled up and looking very much like a baby in the womb. Most filmmakers would settle for a trite Jesus on the Cross reference, but Cuaron loves his baby imagery. That was the first rebirth of Ryan Stone. The second comes at the end, as her module crashes on earth and against all odds, she survives. Watching her swim out of the ocean and then crawl onto land before slowly getting up was like watching an ancient creature evolve right before our eyes. It’s like the Star Baby from the end of “2001″ [Editor's Note: I STILL DON'T KNOW WHAT THAT STAR BABY IS] landed on earth. Ryan Stone might be born a new, but she is no blank slate. She has a hell of a story to tell. I picture the rest of her life will include telling people this amazing story of hers at fancy dinner parties, and then chiding them because they never got to experience it in IMAX 3D. 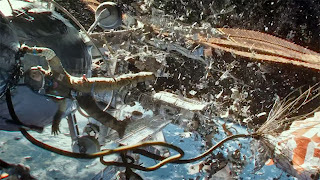 This entry was posted in 3D, Alfonso Cuaron, Avatar, Children of Men, George Clooney, Gravity, IMAX, Movie Review, Sandra Bullock, Sci-Fi, Space, Spoiler Review, Spoilers on October 7, 2013 by ian0592.